PITTSBURGH, PA / ACCESSWIRE / January 29, 2018 / Professional sports ambassadors from Athletes For CARE, a national not-for-profit organization, will headline a medical cannabis sports panel at the World Medical Cannabis Conference & Expo (WMCC Expo), April 12-14, 2018, at the David L. Lawrence Convention Center, 1000 Fort Duquesne Boulevard, in Pittsburgh. 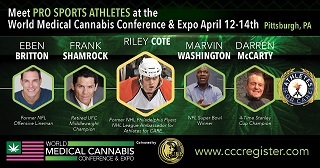 Former National Football League (NFL) players Marvin Washington and Eben Britton, National Hockey League (NHL) stars Darren McCarty and Riley Cote, alongside undefeated UFC Middleweight champion Frank Shamrock will lead a comprehensive discussion on medical cannabis in professional sports at 4 p.m. on Friday, April 13. Jim McAlpine, founder of the 420 Games, a national tour of athletic events, and the New West Summit conferences will moderate the sports and cannabis panel. Founded by pro athletes, Athletes For CARE is dedicated to raising awareness for important health issues facing both professional athletes and the public at large. The organization advocates for research, education and compassion when addressing these challenges. Eben Britton, former NFL offensive linesman with the Jacksonville Jaguars and Chicago Bears. Riley Cote, former NHL player for the Philadelphia Eagles he founded the Hemp Heals Foundation, a non-profit organization dedicated to promoting cannabis as a viable renewable resource for all people. Darren McCarty, former NHL player and four-time Stanley Cup Champion and member of the famous "Grind Line" with the Detroit Red Wings. Frank Shamrock, first-ever champion of the UFC Middleweight division and four-time undefeated champion. Marvin Washington, NFL Super Bowl Winner and cannabis advocate. Hosted by Compassionate Certification Centers™ (CCC), the large-scale WMCC Expo will feature educational seminars, professional training courses, networking opportunities, and compelling presentations on the industry's trending issues. Over 5,000 attendees are expected to attend, 170 exhibiting companies, and dozens of medical, investment, and cannabis industry thought leaders. For tickets or information, call 1-888-316-9085 or visit compassionatecertificationcenters.com.